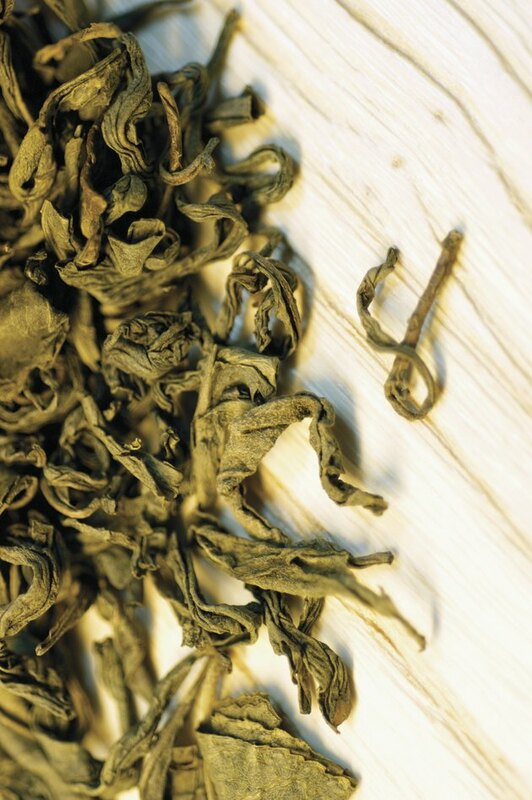 White tea, green tea, black tea and oolong tea are all processed from the same tea leaves. White and green tea are less processed than black and oolong tea, allowing them to retain more health benefits. Green tea has been studied extensively for its health effects, since it's been used traditionally as medicine in China and India. You can consume tea leaves by taking them in capsules or tablets, or adding matcha, which is powdered green tea, to smoothies or other foods and beverages. No matter how green tea leaves are consumed, whether brewed, in powdered form or in capsules, the evidence stands that tea is a very potent source of antioxidants. Most significantly, the catechins found most abundantly in green tea are the antioxidants that give tea leaves their health-boosting punch. According to Harvard Health Publications, catechins have been found to be more powerful in reversing cell damage than vitamins C and E. Antioxidants have been linked to reduced risks of developing some diseases. According to a review of current medical literature on tea's role in preventing heart disease published in "The Cochrane Database of Systematic Reviews" in 2013, the antioxidants in both green tea and black tea have been found to lower cholesterol and triglyceride levels in various human studies. In a study published in the "Archives of Internal Medicine" in 2004, researchers compared tea consumption and hypertension cases in populations in Taiwan. They found that people who consumed green tea or oolong tea daily had significantly reduced risks of high blood pressure, compared to those who did not. Although you can find caffeine-free tea, tea leaves contain caffeine naturally. According to the National Institutes of Health, caffeine stimulates your brain and nervous system, which relieves fatigue temporarily. Green tea supplements are often promoted as weight-loss supplements. Although there's no "magic pill" for weight loss, eating tea leaves could potentially aid in your weight-loss efforts. In a study published in "Physiology and Behavior" in 2006, 46 women on low-calorie diets who took green tea supplements experienced reduced fat mass and small amounts of weight loss after 12 weeks. Check with your doctor before eating tea leaves if you have a medical condition or you are taking any medications. Avoid tea leaves if you're pregnant or breast-feeding, or if you have high blood pressure, kidney or liver issues, or anxiety. Too much caffeine can cause side effects and even overdose. If you drink coffee or other caffeinated beverages, make sure your daily caffeine intake doesn't exceed the upper safety limit of 300 milligrams per day. One tablespoon of matcha contains about 50 milligrams of caffeine, so you'd need around 6 tablespoons of powdered tea leaves to reach the upper safety limit, assuming that you did not consume caffeine from any other sources. Side effects of caffeine may include difficulty sleeping, dizziness, nausea and vomiting, diarrhea, headache and irritability.